The Oxley Explorer operates the NSW TrainLink service daily between Tenterfield and Armidale. 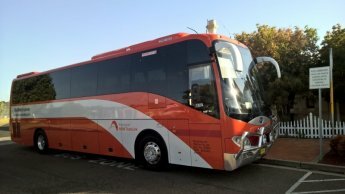 Our coach boasts the following features: Air conditioning , ample luggage space, first aid kit, large windows, leather reclining seats with seatbelts, wifi, surveillance system and rest room. Access for the elderly or people with disabilities is provided by a "kneeling" device which reduces the height people need to step up onto the coach. There are also two wheelchair spaces. Handrails and steps are appropriately marked to assist visually impaired. 1. Visit www.nswtrainlink.info and pay by Visa, MasterCard, American Express or Diners Club Card. 2. Call 13 22 32 between 6.30am and 10.00pm and either pay by Visa, MasterCard, American Express or Diners Club Card, or book your seat and arrange a time to pay for and collect your ticket in person – the booking will be cancelled if we don’t receive payment. 3. Over the counter at your local NSW TrainLink Travel Centre, selected NSW TrainLink or Sydney Trains stations or an accredited travel agent. Please note that NSW TrainLink offers free travel within NSW for Companion Card cardholders and holders of attendant travel passes from a range of eligible organisations. For more information call 13 22 32. Once you’ve paid for your ticket, you can choose to: have it emailed to you, collect it on board or receive it by post (allow 3 working days for processing and postage).